Our enterprise grade website control panel provides you with the features you need to manage all of your websites, from anywhere and at any time. We offer everything from automatic contact forms with CAPTCHA spam protection, integrated Google maps, custom content, syndicated content, blogs, e-commerce, web chat and more! Need more than one website or have more than one business? Your admin login to our control panel features easy access to manage multiple sites. 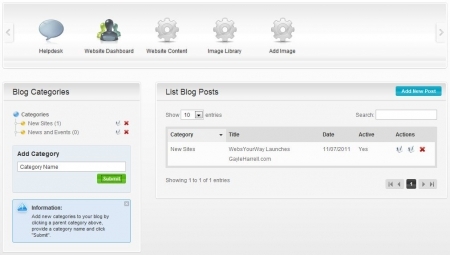 Switch between them easily and quickly to manage any of your WebsYourWay websites all in the same place. We offer a fully integrated website platform - almost every service we sell can be purchased both standalone and all bundled together in the perfect professional web presence. Have a few websites that need some of our features? Our QuickBooks connector, live customer service web chat, and even our micro-cart can be connected to nearly any website, anywhere. But when you want the tightest and best integration of our services, choose one of our platform websites and load it up with all the features you need! With a simple mouse click, you can add, edit, hide and delete pages from your website, without worring about how the new page design will look. Simply use our built in WYSIWYG content editor, and you can create pages that fit right into your website - no HTML experience required. For sites with more than 5 simple pages, you can add "web page directories" to your site in order to better organize your content. 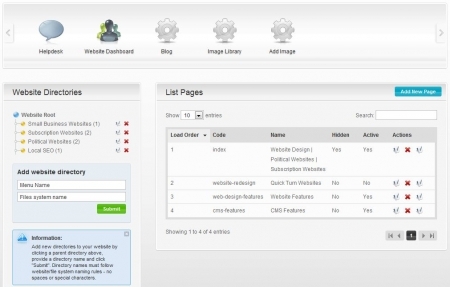 The system reads your pages and directories, and automatically builds an integrated menu sysetm for your entire site. In addition to our already pre-optimized designes, using our page and director editor you or your SEO consultant can control the directory and page URLs, generate appropriate META content and page titles for top ranked search engine optimization. Depending on the site design you select, you can add and update content that appears in "global" sections on your website - in other words on every page. For example, if you'd like to add driving directions to your automatic Google Maps page, simple adding a content Section provides complete customization of our built-in pages!